For my birthday in 2013 I ran a campaign for charity: water. My original goal was to raise $500 to help provide clean, fresh water to a community that desperately needed it. Thanks to the generosity of friends and family, I was able to raise $749. It typically takes 18 months from the end of a campaign to a completed water project. Well, it’s been just over 18 months since the end of my campaign. The total project cost was $18,343.81. It took 25 different campaigns to fund. 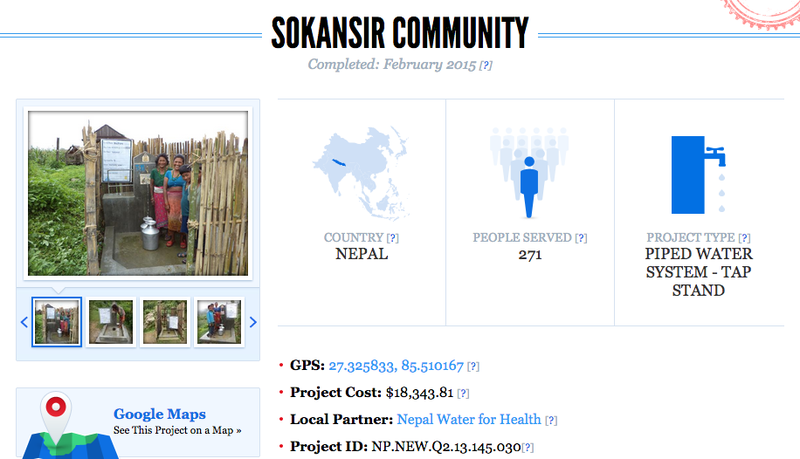 I am grateful to have been able to play a part in bringing clean water to people in Nepal. I would also like to once again thank all those who were able to donate: My wife, my parents, grandparents, my wife’s parents, my sister Jessica, Ryan Borkenhagen, Skyler & Tara Chase, Nat Harward, Du Hoang, Timothy Kavmark, Igor Lebovic, Brian Matthews, Mike Mullen, Pierce Smith (brother-in-law), and 9 people who donated anonymously. Although it does take a bit of work to get the word out so people know they can donate, starting a campaign for charity: water is really easy. I recommend starting your own. If you do, please let me know and I’ll do what I can to help out.